Insight IVR allows you to easily design and customize interactive telephone applications using a simple drag and drop interface. Start out with a call flow sketch on paper and within minutes you can build a fully functional application that your clients can call into. This Insight "Fast Build Kit" is designed to help you meet deadlines. 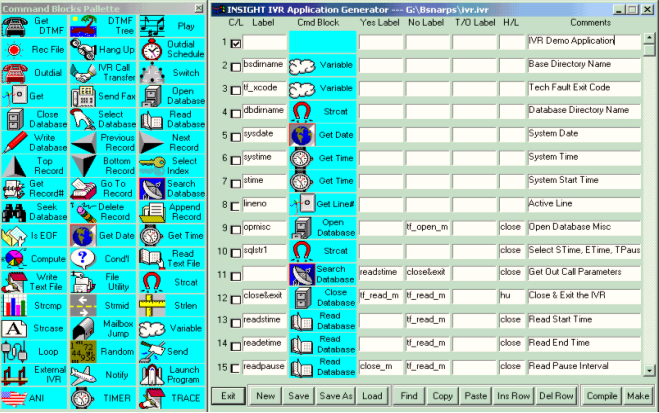 The Insight Drag and Drop development facilities provide full featured icons which can be moved and connected to a free form call flow. Do you want to play a file? Get a record from a database? Call out to a customer? No problem!